View More In Knife Blocks & Storage - Page 8. Mesh small Cutlery Tray with Foam Feet is a unique take on the cutlery utensil organizer which has a silver finish, and 5 compartments. The tray is made of stainless steel. This is so you never have to worry about rust. The silver finish provides European clean lines and a superior design. The 5 compartments provide ample space for silverware storage. 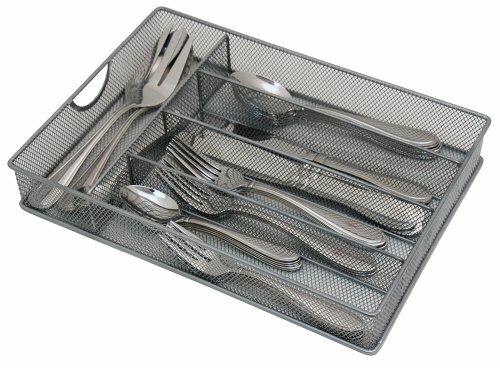 Powder coated mesh tray is scratch resistant and will not damage your silverware. The silverware tray will not collect dirt and/or grime like similar plastic trays. No upkeep is required easy to clean at anytime. Reinforced steel mesh features a low profile, that fits in all most all standard drawers. Use mesh tray for cutlery, flatware, office supplies, or mix and match. Quality construction, ruggedly elegant good looks. The Mesh small Cutlery tray with foam feet makes for a great Housewarming Gift for any new home, Graduation Gift, Thanksgiving or Christmas Present. It also makes a great gift for either a man or a woman, Birthday, Mother's Day, Father's Day, Anniversary gift, Bridal Shower, Valentine's Day, or Wedding Registry. A unique present that will be well received by your mother, father, brother, sister, daughter, girlfriend, boyfriend or any good friend or relative who longs to be in the kitchen. Protect your silverware from any of these name brands: Oneida, Lenox, J.A. Henckels, kate spade new york, International Silver, Gorham, Villeroy & Boch, Mikasa, Yamazaki, and Marchesa. Warranty: Lifetime Limited Warranty is provided by Storage Technologies. This warranty is void if the product has been purchased from an unauthorized distributor. Dimensions: 12.6" x 9.45" x 2.15"
Stainless steel wire mesh has spacious storage capacity, and protects your silverware from damage. The silver epoxy coated finish provides European clean lines and a superior design. We believe your storage container should look as a good as what you are storing. 5 compartments that easily accommodate your silverware storage needs. The silverware tray will not collect dirt and/or grime like similar plastic trays. The mesh tray is comprised of Epoxy coated Reinforced Stainless Steel Wire Mesh. Foam non-slip feet ensure the tray does not slide when opening or closing the drawer. Easy to clean at anytime. No upkeep is required. If you have any questions about this product by Yesker, contact us by completing and submitting the form below. If you are looking for a specif part number, please include it with your message.